"Really easy and tasty. Similar to elephant ears." In a small bowl, mix together the cinnamon and sugar. Flatten out each pastry sheet, sprinkle sugar mixture evenly over the surface. Roll up the sheet the long way, and slice into about 15 slices. Place on a cookie sheet and bake for 15 minutes in the preheated oven. Tried the recipe as stated. way too much cinnamon maybe use only 1/2 as much. A little milk brushed on before spreading the sugar and cinnamon might help it stick together a little better. I added powdered sugar to mine and it made all the difference. Very easy to make! Make sure you keep an eye on them. Mine were done in about 10 minutes. 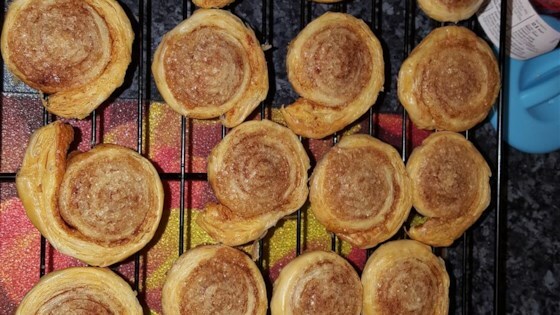 While these are very easy to make, they didn't taste as good as I was expecting. I brought these to work for a potluck & ended up bringing most of them back home with me.